War time conditions made it imperative that stocks of paper be conserved and as sales of the 1940 Health stamps had been around 60 percent of the 1939 Health stamps the usual practice of destroying unsold stamps once the issue was withdrawn was considered wasteful. Instead the remaining stamps plus a small supplementary printing were overprinted 1941 - just so that the 1941 issue could be distinguished from the 1940 issue. 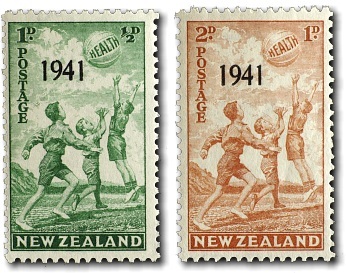 There are slight differences in the intensity of the coloured inks used between the two printings with the stamps printed in 1941 having a deeper colour.